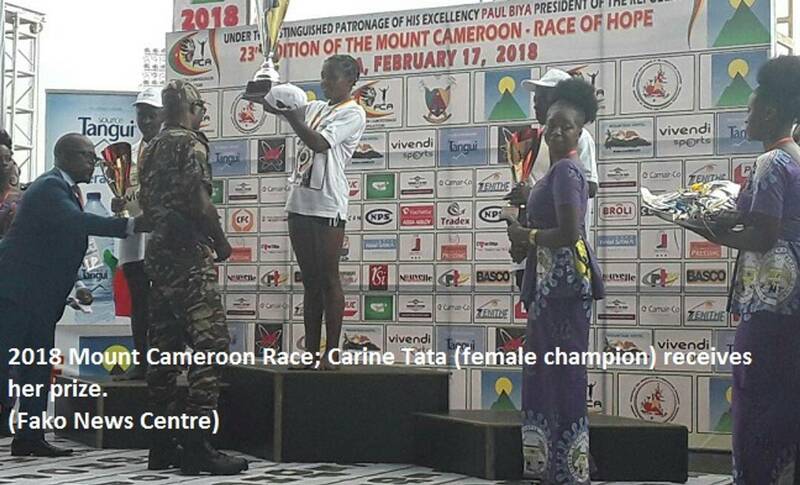 Former champion who was narrowly beaten last year to second position, Godlove Gabsibuin, has made a re-bounce to win this year’s edition of the Mount Cameroon Race of Hope. Mr. Gabsibuin finished the race in 4hrs 30mins 56secs while last year’s champion, Fai Elvis Ndzedzeni this time finished second position, about 8mins behind Godlove. A Kenyan, Chalimo Luka Kipkemoi finished in 3rd position. This was the first time after 20 years that an international athlete finished the race in the first three. Mr. Kipkemoi and another Athlete from Kenya led the entire race far ahead of local athletes from Molyko all the way to the summit, with Kipkemoi the first to reach the summit. However, the Kenyans had problems descending the rocky slopes of the mountain and hence were overtaken by some two Cameroonian runners. In the female category, it was 20-years-old Tata Carine who finished first in 5hrs 26mins 54secs ahead of last year’s champion, Ngalim Lizette. Wirgo Kpufanla finished 3rd position in this category. Tata Carine has finished 3rd position twice in previous editions of this race. This year’s race witnessed no major athletes based in Buea. 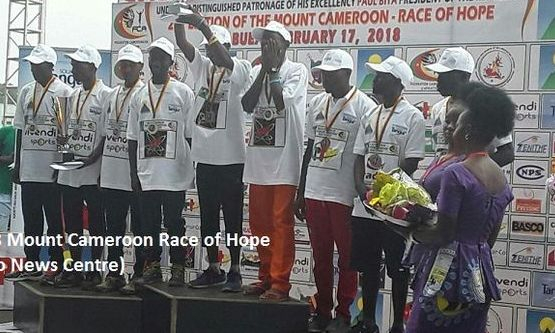 The son of Queen of the Mount Cameroon Race of Hope, Lyonga Esombe who has finished 3rd position twice did not participate because he was attacked and shot in the leg by unidentified gun men in his home about two months to the race. This gave him a technical knockout from the race since he was still nursing his wounds. Many wept for his absence. Another Buea-based athlete who has often been amongst first 10 athletes in the last 10 years, Lyonga Mondoa, suffered an injury recently while participating in a racing completion. He too was still suffering from the injury and hence could not take part in this edition. Some former champions also failed to participate in the race because they were disqualified by an innovative medical check. This medical check disqualified over 100 athletes. This year’s edition of the race witnessed a lot of security measures taken to protect athletes. Only official vehicles and motor bikes where allowed to use the main road from 6:30 am to about 2:00 pm when almost all the athletes must have descended from the mountain. Unlike previous years, private vehicles used to be allowed to use one section of the road but some reckless drivers often crossed over to hit athletes.